A Panama Canal cruise is not an ordinary cruise. While the sea days and the other ports of call are important, the focus is on the day that you spend in this unique and historic engineering marvel. Everything else is secondary. 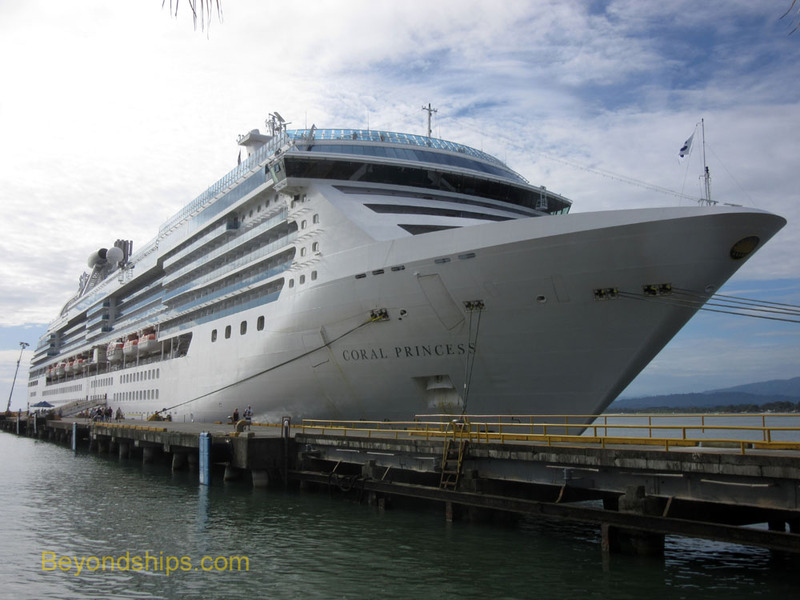 Coral Princess specializes in Panama Canal cruises. It is what she was designed to do. In fact the ship was named in the Panama Canal by the President of Panama. And since the Panama Canal has been on her itinerary since she entered service in 2002, it has visiting the Canal down to a science. The ship's dimensions are Panamax, which means that she is the maximum size that can get through the locks of the original canal. Indeed, the lock walls are just inches away from the sides of the ship. The voyage is built around the visit to the Canal. There are lectures about the Canal, documentaries on the cabin televisions about the Canal, Panama Canal souvenirs in the onboard shops and numerous shore excursions for the day in Panama. While the highlight of this cruise is the Canal, the itinerary is designed to present a variety of experiences. In Aruba and Ocho Rios, you have well-developed ports presenting the familiar Caribbean cruise experience. In Cartagena and Puerto Limon, you have less established cruise ports and the experience is one of discovery for most North American passengers. Onboard there is much to do. Entertainment includes production shows, comedians, live music and enrichment lectures. There are also the usual cruise ship activities such as trivia contests, karaoke and bingo. For just relaxing, the ship has two full pool areas and two small pools. There is also a spa and a fitness center although small by comparison to those found on the mega-ships entering service today. Coral Princess entered service in 2002. The ship's décor reflects those times with some public areas such as the atrium done in a Las Vegas style while the remainder of the public areas are done in a more conservative contemporary style. The ship seems well-maintained and clean. This is not to say that Coral Princess is a time capsule from the last decade. Princess has refurbished the ship over the years and has added new features. One example is the delightful International Cafe, which occupies territory that was once part of the casino. In our view, the food on the Princess ships consistently deserves high marks. On this cruise, Princess' Master Chef Alfredo Marzi was filling in for the ship's executive chef. Inasmuch as Chef Marzi is responsible for many of the dining concepts and menus abroad the Princess ships, his presence held great promise and Coral Princess did not disappoint. The food in each of the dining outlets that we tried was very good. One feature that we particularly liked was the Alfredo's Pizzeria. This concept premiered on Grand Princess as a new dining venue when that ship went in for a major refit a few years ago. It has since been developed further and is featured on Princess' latest ships, Royal Princess and Regal Princess. It is not your typical pizzeria. Rather, it offers individual size gourmet pizzas made fresh when you order it. The taste is great and they are fresh. On Coral Princess, Sabatini's specialty restaurant becomes Alfredo's at lunch time so you also have the beauty of this Tuscan-inspired room. And it is all complimentary. We were once again impressed by the Chef's Table experience - - a fine dining feast. Princess originated the Chef's Table concept and each one we have attended has been spectacular. This one was presided over by Chef Marzi and so it was even more special than usual. It began with a visit to the galley during dinner time. This was, however, more than a glimpse behind the scenes. Chef Marzi presented us with a seemingly endless procession of appetizers while Maitre d' Neville Saldanha poured glasses of French champagne. We then adjourned to the Bordeaux dining room where a lavishly decorated table had been prepared for the group participating in this event. We were presented with more courses, most of which were prepared tableside by Chef Marzi. A sommelier poured the wine to accompany each course while presenting some background information. It made for a memorable evening. Coral Princess is a spacious ship. She is an enlarged version of Princess' Sun-class ships but carries just about the same number of people. Thus, there is more room per passenger. Speaking of passengers, most people on this cruise were middle-aged in their 50s and 60s. This is not surprising as cruises of more than seven days duration tend to attract a more mature crowd. Also, school was in session in North America and so there were few children on the cruise. The great majority of the passengers were from the United States and Canada. On past Panama Canal cruises, we have found that many of the passengers were seasoned travelers who wanted to see something out of the ordinary. However, on this cruise, we met quite a few first time cruisers. When asked why they had selected this cruise to begin their cruising careers, they indicated that they too were seeking to do something out of the ordinary. Turning to Coral Princess' nautical qualities, Coral Princess is long and sleek and capable of traveling relatively fast (24 knots). However, we did not get to see any displays of this speed as the itinerary is designed so that the ship only needed to keep up a leisurely pace. Immediately prior to this cruise we had been on Princess' newest ship Regal Princess, which is much larger than Coral Princess. The weather on the two cruises was about the same. However, the movement of the sea was more noticeable on the smaller ship.